Before flying to Japan, the kids considered China and Japan to be basically one in the same except that Japan had sushi. If they learned one thing on this trip, it’s that these two countries are vastly different. Arriving in Osaka was a welcome relief from China. It’s so clean! It’s so orderly! People queue even to get on a subway train. In China, people don’t even let you get out of the elevator before they step in. 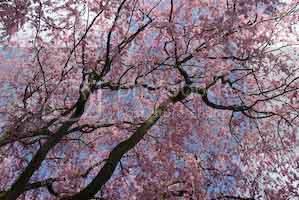 We caught the train to Kyoto and were thrilled to spot cherry tree’s in full blossom along the way. Our timing wasn’t so bad after all! A taxi got us to the modern ryokan that we had booked tucked away down a side street in the downtown area. It turned out to be a great location for exploring the city. All through our visit to Japan we stayed at ryokan’s with Japanese style rooms. This first one was one of the best and was a generous 12 tatami mats in size. The staff prepared our beds each evening and put them away in the morning. 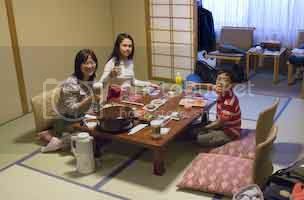 Breakfast was served in the room by a motherly Japanese lady chatting away in Japanese as if we understood it. Every evening, the kids looked forward to their wash and soak in the public baths. One fascination was the electric toilet seats. They’re heated! And they wash your bum with a spray of warm water and blow dry it too! I can’t help but wonder what the carbon cost of millions of warm toilet seats must be. The first day of sightseeing was a washout – literally. It rained hard. We attempted to go to a museum but it was closed being a Monday. We salvaged the day by browsing the Nishiki food market and the Daimaru Department Store. The food floor in Daimaru would put Harrods to shame. We also explored the Teramachi and Shinkyogoku covered arcades. Determined to do some real sightseeing, we joined a walking tour of the Gion district in the evening despite the rain. The next day was grey but at least the rain had stopped. We did the classic walking tour of Higashiyama going from Kiyomizu-dera up to Heian-jingu via Maruyama park. 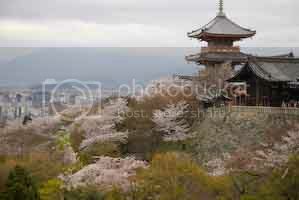 The temples blur together as there’s so many to visit but the cherry blossom tree’s are simply stunning and are truly glorious when the sun breaks through and lights them up to their full radiance. The wind occasionally blew the petals into a gentle blizzard that filled the air. The following day, us boys visited some more temples in the northern bit of Higashiyama and walked along Tetsugaku-no-michi (Path of Philosophy) while the girls joined a long Arts & Crafts walking tour. I regret that we didn’t plan to spend more time in Kyoto. You can certainly cover the highlights in three days but it would be very easy to spend a week or even more exploring the area. 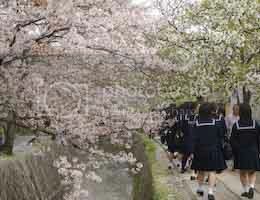 And it’s very well worth the effort going during the sakura season.